Living and working in London, it’s so easy to take for granted all of the amazing things this city has to offer. I walk past sights on my daily commute that people travel thousands of miles to come and see and equally there are numerous ‘must-do’ places to visit that I, as a lifelong Londoner have never actually seen. This seems like a bit of a crime so recently I’ve vowed to put some effort into exploring this amazing city and tick some things off the bucket list. This includes visiting and trying out new restaurants as I have such a long list of places I want to try! The Ivy﻿ is a well established London landmark that’s graced the occupying it’s corner of West Street for a century. The 1990’s saw it become a favourite of celebrities it’s popularity and reputation hasn’t wavered since. In more recent years The Ivy’s branches have been spreading out across the capital, opening up more casual cafés and brasseries making the fine dining experience slightly more accessible for the like of us who don’t make a habit of hanging out in celeb hotspots. The Ivy Soho Brasserie opened earlier this year and has been on my to-do list ever since, plus I managed to squeeze this into an epic day of visiting The London Dungeons and going to see The Lion King on stage. First thing’s first, I absolutely adored the dining room. It’s opulent, it’s elegant, it’s luxurious and it’s quirky all at the same time. Plush velvet sofas and eclectic art are definitely my thing. It somehow manages to feel super indulgent and luxurious while at the same time cosy, relaxed and at home. The staff were all really helpful, I asked quite a lot of questions about different things on there menu and they were really knowledgeable which is always a good sign. I kicked things off with a tuna carpaccio, which was a really generous portion size and was dotted with sesame, watermelon and a miso mayonnaise. The little drops mayonnaise contrasted beautifully with the lighter fresher flavours coming from the watermelon and the tuna. Watermelon is never something I’d have considered pairing with tuna, or any fish for that matter, but I’ll definitely try it myself at home. I stuck with a fishy theme and chose the swordfish for my main course. It’s not my favourite of fish, it can be dry and it’s not as delicate as others, but I haven’t had it for quite a while and I wanted to choose something different. The accompaniment of cherry tomatoes, toasted fregola, pesto, lemon and basil are all flavours I love and this really appealed to me. 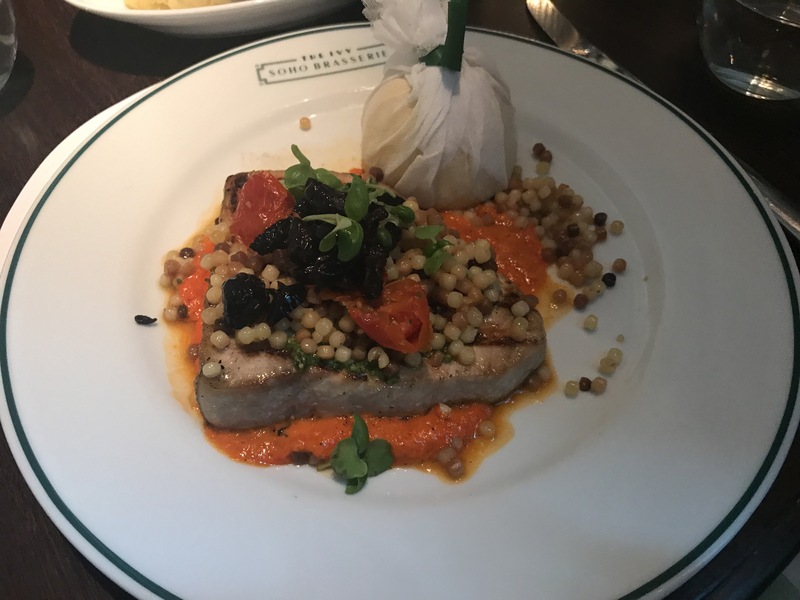 I’m really glad I chose this dish as it has really put swordfish back on the map for me, it was cooked perfectly so it wasn’t dry and it had that great flavour you get from cooking on a grill. 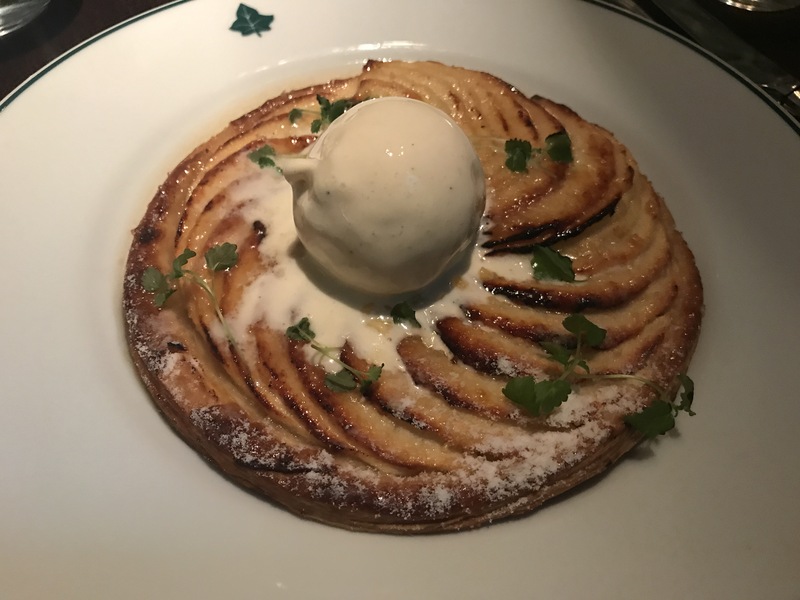 My final choice of the meal was a beautiful apple tart fine, which was flambéd in calvados at the table which added a great sense of theatre to the occasion. Again this was a really generous portion, apple desserts are always my favourite and this didn’t disappoint. 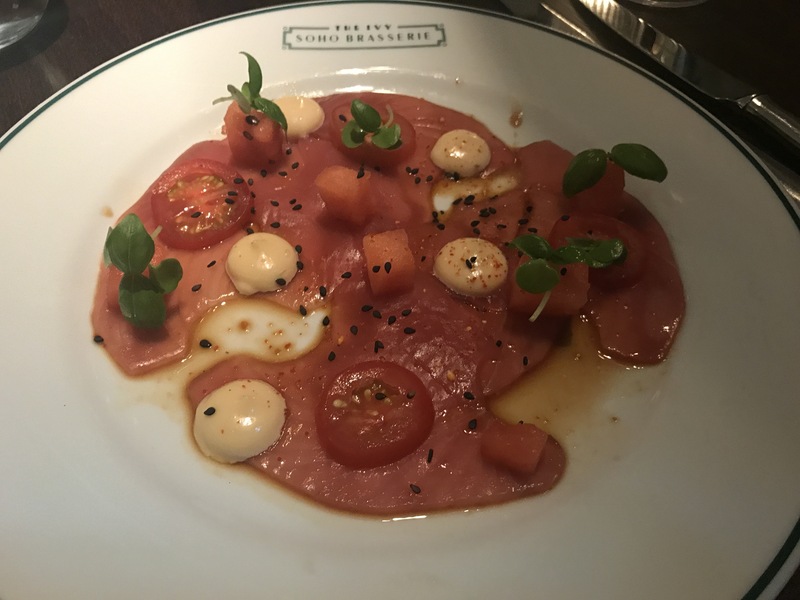 All washed down with a couple of peach Bellinis, I thoroughly enjoyed every aspect of my meal at The Ivy Soho Brasserie and I can’t wait to go back, I’ve already requested a visit for my birthday! I’ve obviously still got loads of restaurants to tick off my to-do list but for now The Ivy Soho Brasserie is topping my list of London favourites!